Sunset above Mount Teide (Pico del Teide) possible to seen from la Montana de Femes at Lanzarotte island. Taking a picture of mountains with sunset or moonrise on the background is a nice experience. Some of photographers used to do this accidentially when travelling. People, who knows the area better usually can predict exactly what time the Sun or Moon will rise & set above the outline mountain communities or closer peaks. There are a few websites, that allow you to check the local efemeras of sunrise & sunset and moonrise & moonset with a rough azimuth. Those information are very helphul when you are planning to take a photo of this phenomenas with a nice view on the foreground. Pic. 3 The Photographer Efemeris. All websites listed above can help you to adjust your viewing site to the local astronomical ciscumstances and chase the sunrise & sunset in conjunction with a nice mountain-toothed horizon. Moreover you can check the efemeras throughout the day also. Why is adviseable to use the Peakfinder.org then? 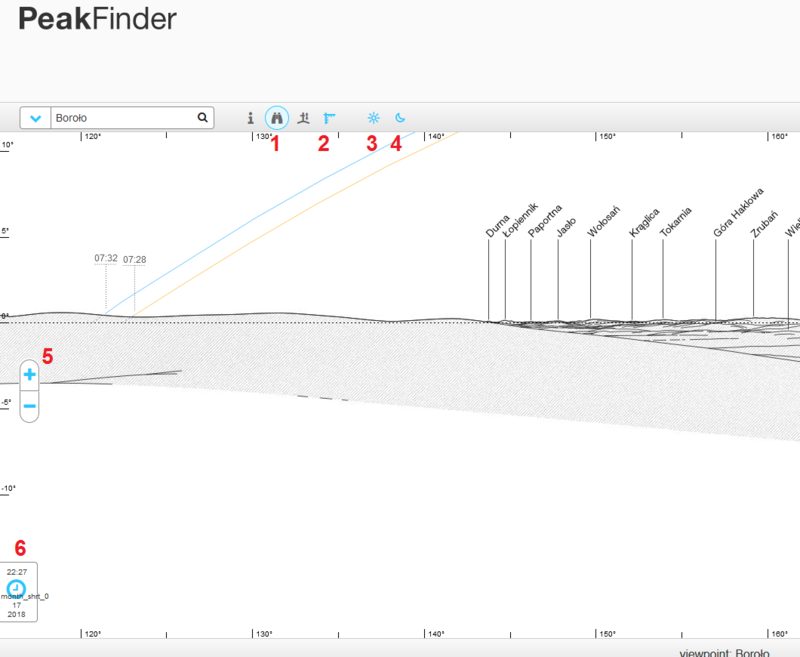 Peakfinder.org is the newest panorama generator, that offers very detailed description of the horizon. The basic objective of this website is gathering and providing the names of all peaks around the world! The base contains around 350k mountains! This is amazing! 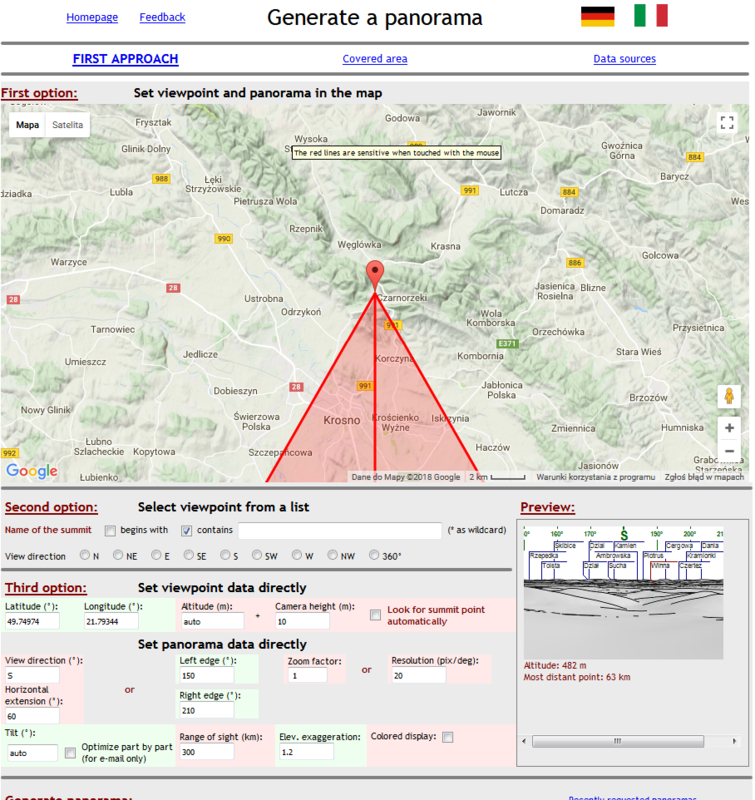 The server cooperates with Openstreetmap.org, where the names of all peaks come from. Is not only one panorama generator obviously. 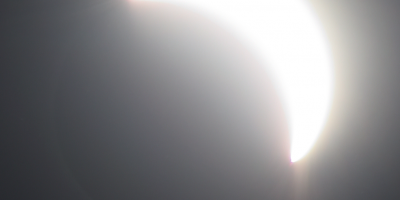 Recently I have described another one for you: Heywhatsthat.com to make a multiple-summit panoramas. There is also another, very similar to current one, made by Urlich Deuschle (Pic. 4), where the database contains also many names of summits. 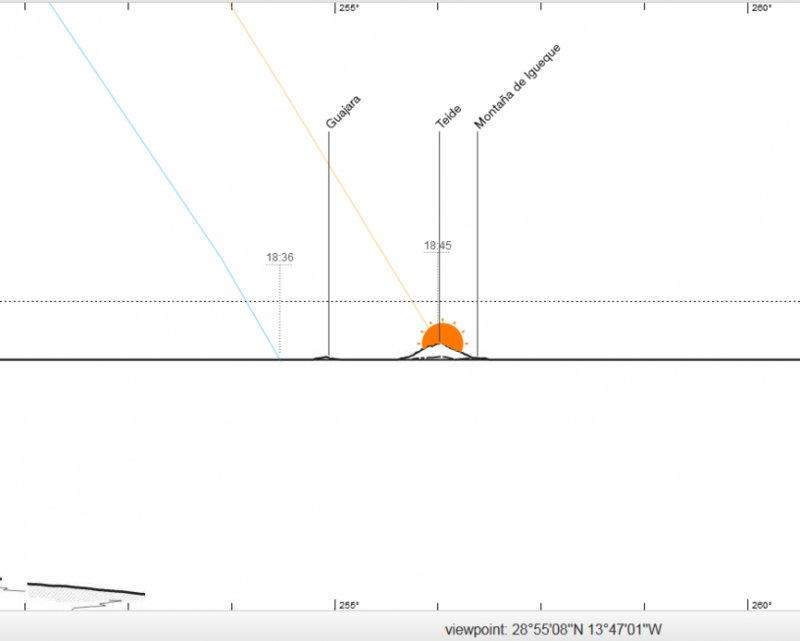 Peakfinder.com has undeniable advantage, that is the daily track the Sun and Moon across the sky (Pic. 5). Pic. 4 The Urlich Deuschle panorama generator. Pic. 5 The Peakfinder.org with all named summits and daily Sun & Moon track across the sky visible. The main essence, that I decided to come through this website is chasing the sunrise & sunset or moonrise & moonset above the beautiful mountainuous horizon. 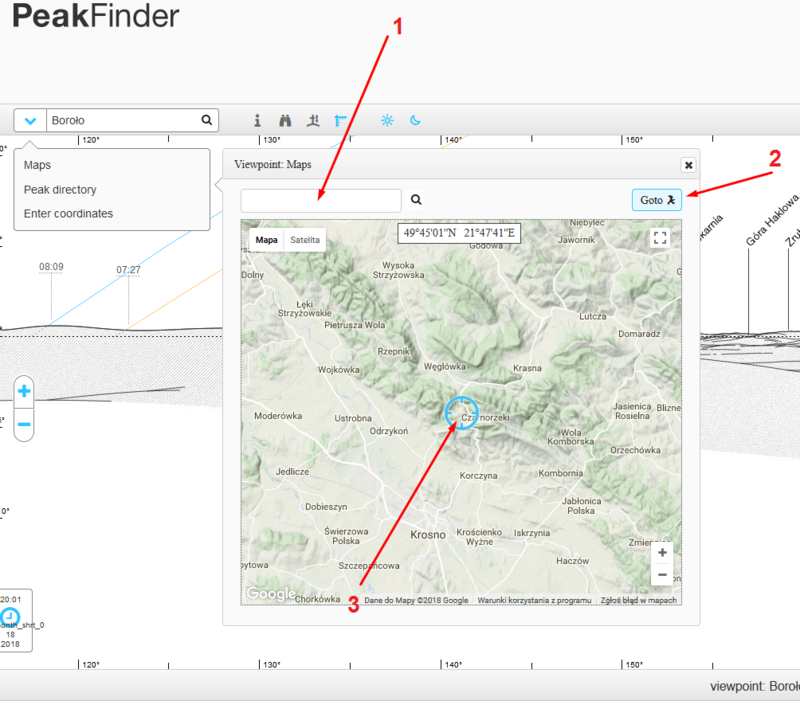 Now with Peakfinder.com this is very simple. You should care about 6 options, that offer this panorama generator (Pic. 6). There are the most important options for you to navigate and set your viewing site. Pic. 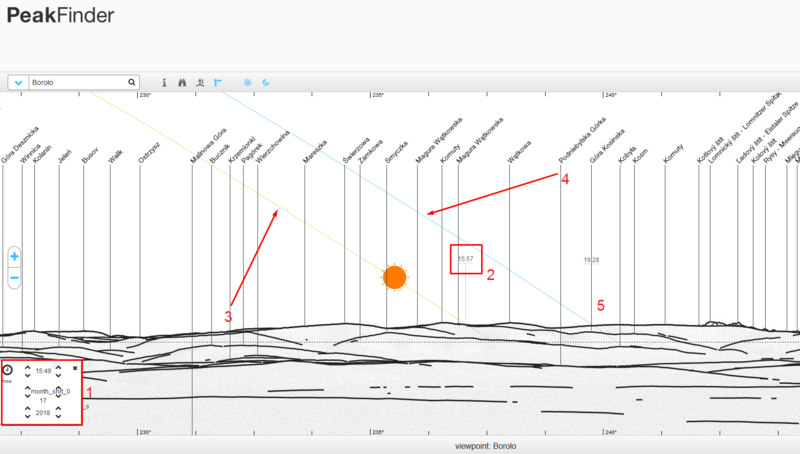 6 The most important Peakfinder.org options: 1 – Digital binocular mode, 2 – Rulers, 3 – Solar orbit, 4 – Lunar orbit, 5 – Zoom in/out, 6 – Date/time. You can find 4 options in your main toolbar on the top. Bear in mind, that they have been switched on (blue color rather than grey). The exception to this is the binoculer mode, that is needed only when you want to check what are the summits on your narrow line of sight. It may be helpful when you viewshed is really wide. The binocular mode also allows you to rapid change the observation site (Pic. 7) when set your pointfinder on some summit roughly and click on the human icon (bottom right). Pic. 7 The “Digital binoculars” mode with one of the summit selected (highlighted by bigger orange spot) and option to move there right now (human icon). The most important option for our purpose is the time & date and zoom in & out options. You can adjust the time to the moment, that you are interested in. 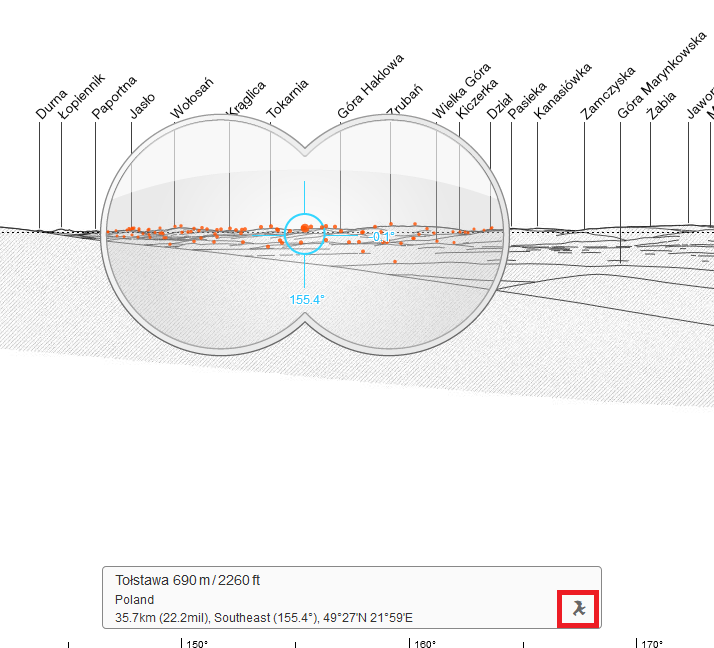 Zooming in to maximum you gain as much details as you can using this website (Pic. 8). Pic. 8 The most important options in use. 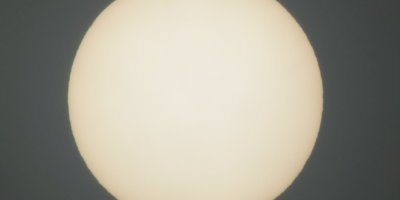 The area has been zoomed into maximum value: 1 – time & date options, that are to be changed, 2 – Local sunset time, 3 – Sun orbit across the sky, 4 – Moon orbit across the sky, 5 – Local moonset time. I would like to point out you the exact azimuth of sunset & moonset, that is also marked with dotted black vertical line (Pic. 8). I put all my considerations on the viewing place, that is located in Dynowskie Foothills (Czarnorzeki). This place is very familiar for me. I used to go there and watching a remote mountain communities. You can change your observation site when fill up the field or click the magnifying glass on the top left corner. 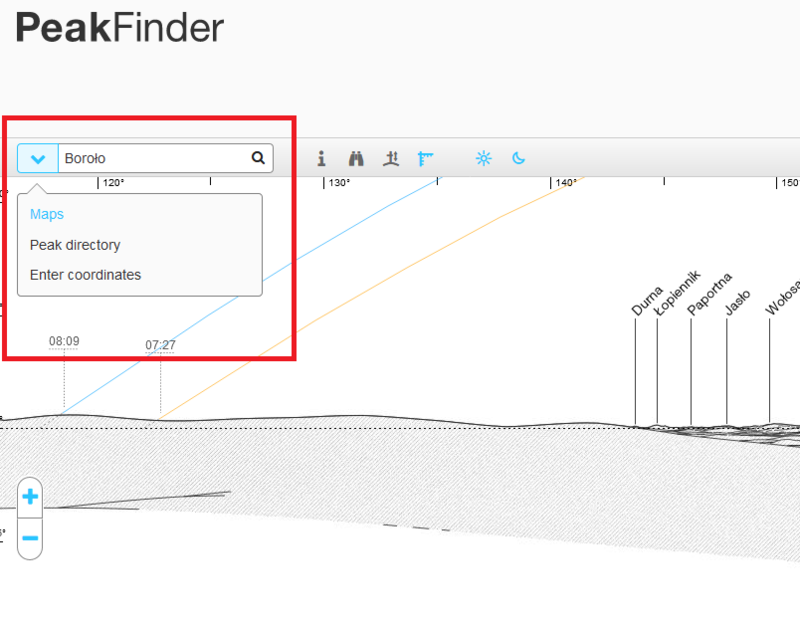 You also have another options to find your place there (Pic. 9). Pic. 9 Searching options in the Peakfinder.org panorama generator. 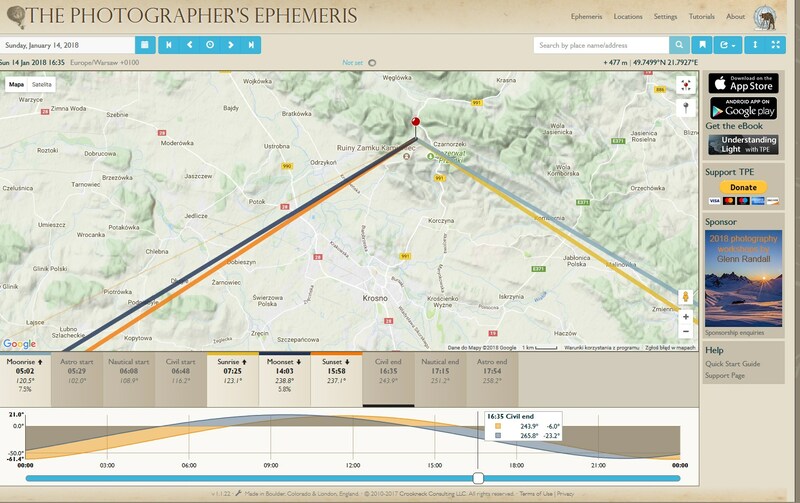 You have the choice of the following: “Maps”, “Peak directory” and “Enter coordinates”. 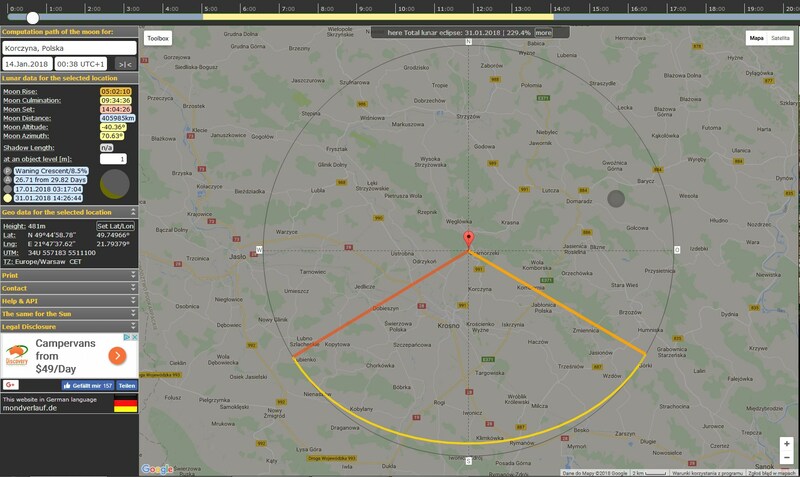 Personally for me the easiest way to set my new viewing site is using the “Maps” option (Pic. 10), where I can find my location directly. Pic. 10 The “Maps” searching option in the Peakfinder.org panorama generator: 1 – The name of the summit, that you can put into the bracket when you know, 2 – The “Goto” button, that redirect you to new position immediately, 3 – The crosshair, that in the middle shows your location target. Now I am done. 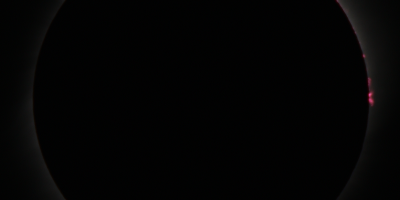 This is all, that you can do when using this panorama generator. Using the Peakfinder.org panorama generator is a really straighforward issue. Back to my location this is one of many places in Subcarpathian region (south-east Poland), where you can spot the highest community of Carpathian Mountains – the Tatras. Once weather is favourable the group of high pinacles is looming from south-west. In the late autunm mid-winter season you can try to see sunset above the Tatras. It looks amazing! See the image below, that shows what is the earliest and the latest day in winter, when you can see it (Pic. 11). Pic. 11 The sunset dates above Tatras to be seen from Czarnorzeki and also moonset on 18.01.2018. Pic. 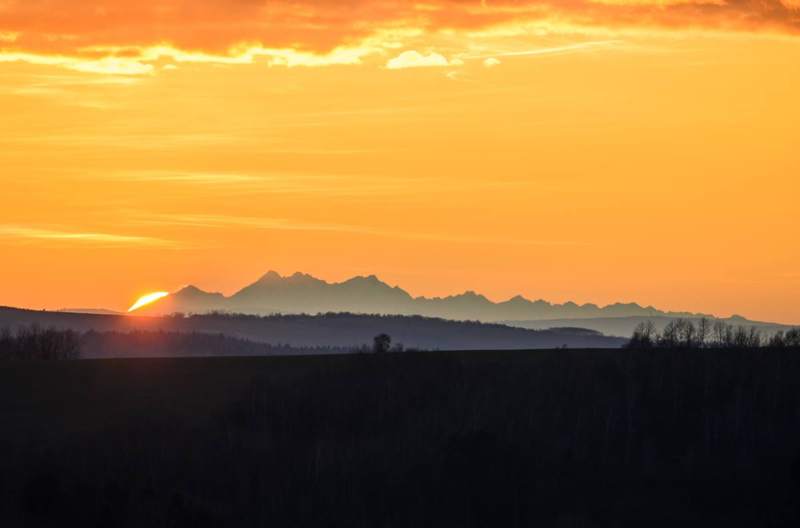 12 Sunset above High Tatras seen from Niewodna on 25th December 2017 (Piotr Gawron). Pic. 13 Sunset above High Tatras seen from Czudec on 6th January 2018 (Michał Skiba). Pic. 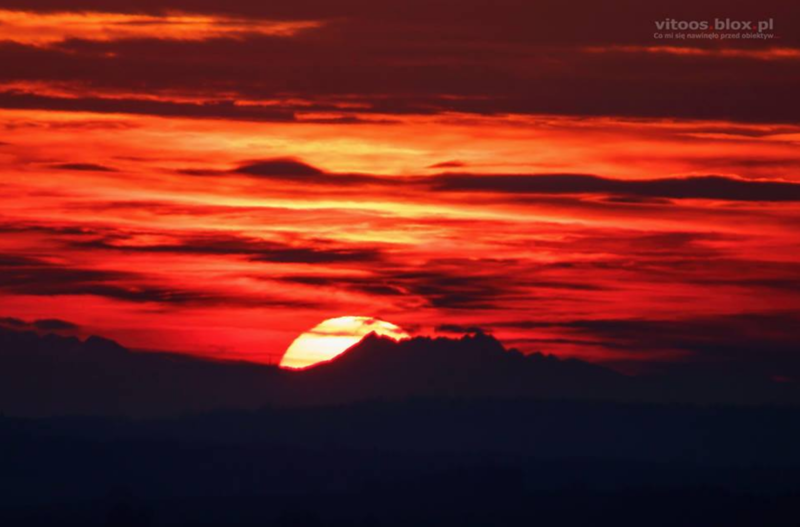 14 Sunset above High Tatras seen from Szkodna on 6th January 2018 (Witold Ochał, vitoos.blox.pl). Pic. 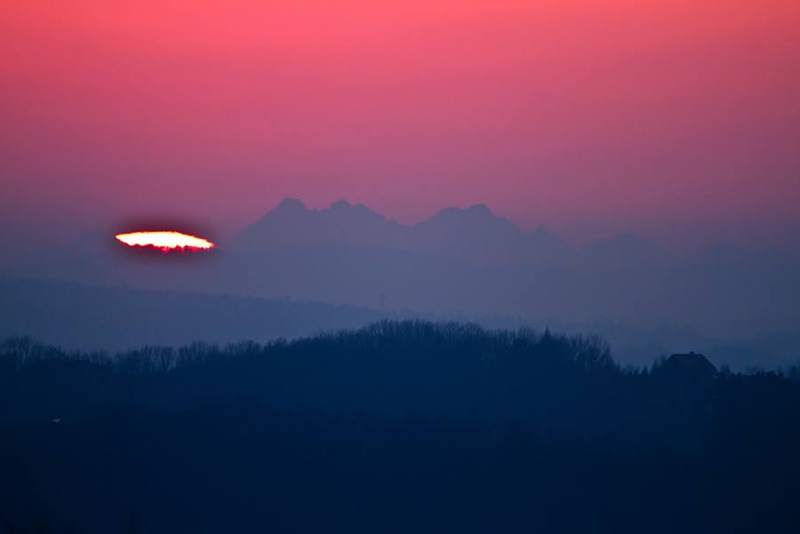 15 Sunset above High Tatras seen from Matysówka on 15th January 2018 (Michał Skiba). Pic. 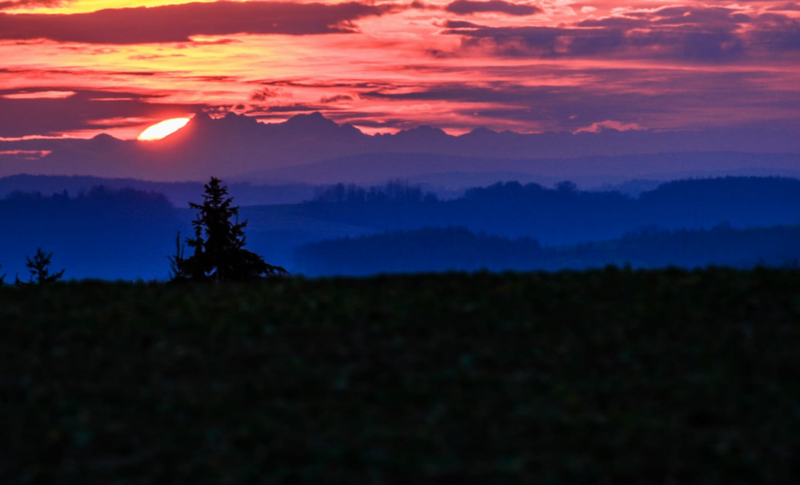 16 Sunset above High Tatras seen from the hill above Magdalenka on 18th January 2018 (Maciej Magierski). What about another locations? I personally would love to see the sunset about the Teide Volcano on Canary Islands (Pic. 17). Pic. 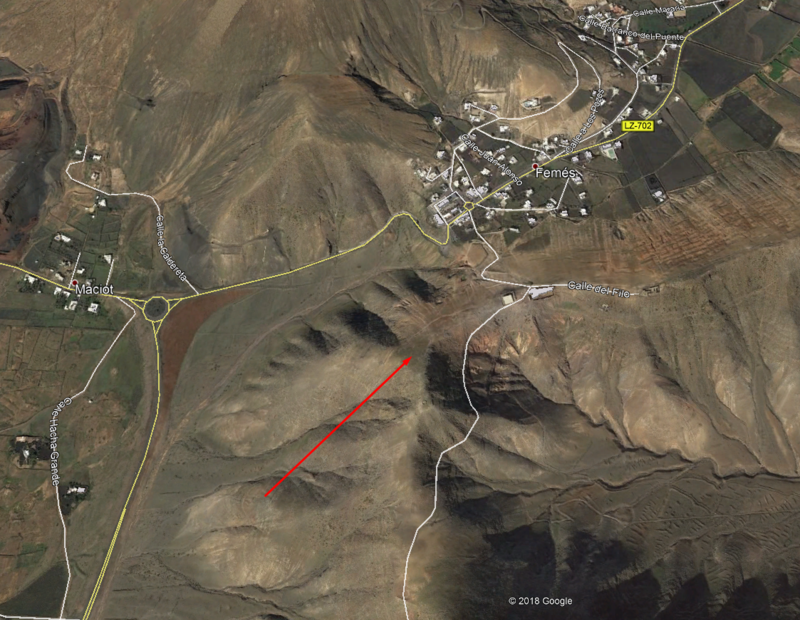 18 The Montana de Femes location on Google Earth. Moonsets above high mountains are also amazing! (Pic. 19). Howeverthey may by much harder to chase, because the Moon changes declination very quickly unlike to Sun, that inching day by day through some part of the horizon and gives you more days to chase a proper weather. Pic. 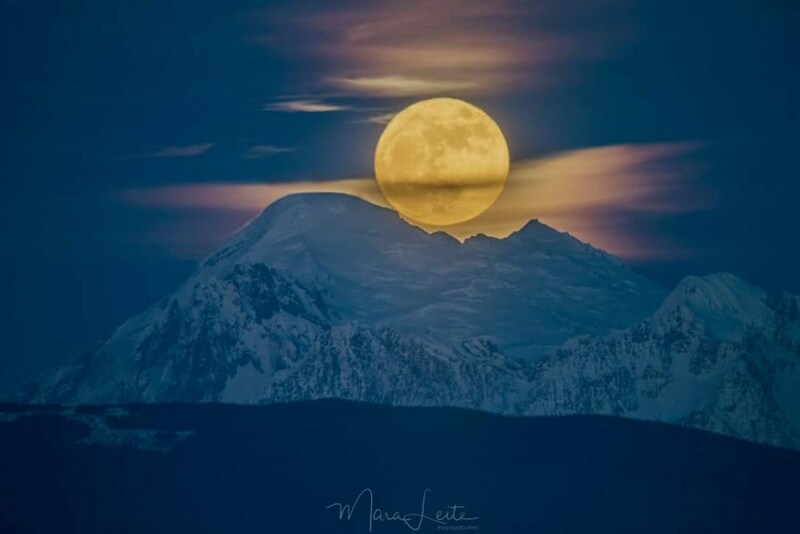 19 Moonset above high mountains (Mara Leite). 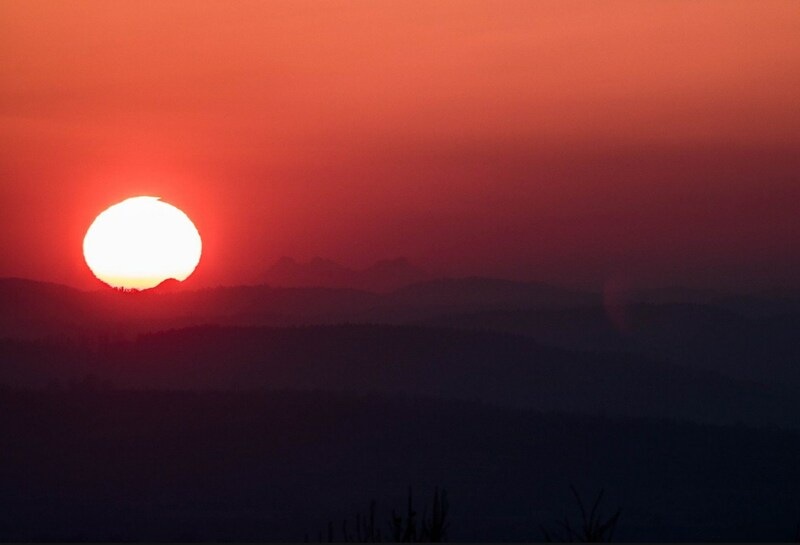 I hope, that this panorama generator will help you to set the best viewing site for amazing sunset or sunrise.